Our partner and guiding conservation voice in Kazakhstan, Oleg Loginov has updated SLC with the current snow leopard news in his country. Oleg and his wife, Irina, have been integral in establishing the snow leopard as an ecological symbol in Central Asia. 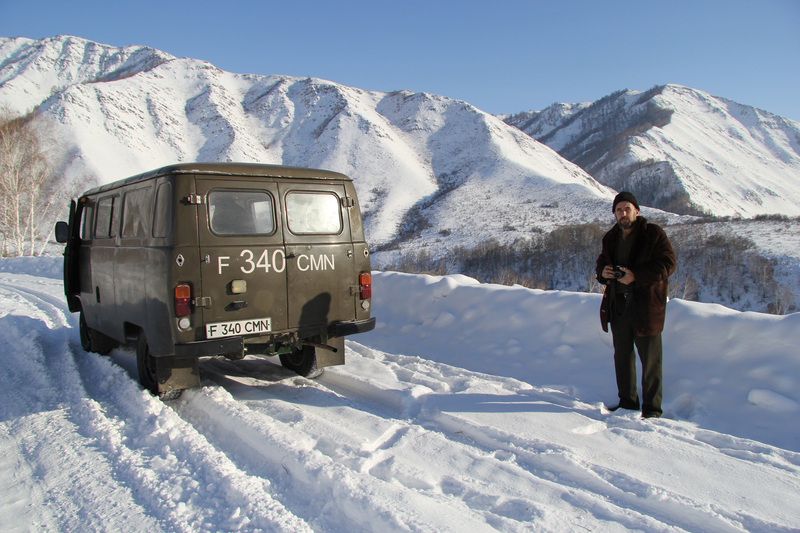 In this report of treacherous travel, Oleg expresses the necessity in having a reliable, sturdy car in the mountains of Kazakhstan. Please visit our fundraising page on CrowdRise to donate toward buying a new field vehicle for Oleg. “I only have arrived last night from Katon-Karagay. We went by Sergey Starikov’s very old car “UAZ” (1983). It is a hearty, all-wheel drive minibus with some problems with the brakes and windshield wipers. Also near to Katon-Kargay the back wheel burst. In the full darkness we changed it. The car does not go faster than 90 km/h., therefore it took us 8 hours to get to our destination. On my Nissan it would be much faster, but risky as on passes have not time to clean snow and a wind inflates the big weights of snow through road. Some times we “punched” such “snow hills” literally. But in Katon all is much better. It is much warmer there, more like the Almaty area. We met all research assistants of national park, and discussed the Agreement on cooperation. As a result – on January, 11th we met with the director of the park Erlan Mustafin, who signed the agreement. Now it is necessary to send the Agreement to Astana for the signature by the chairman of the Forest Committee. 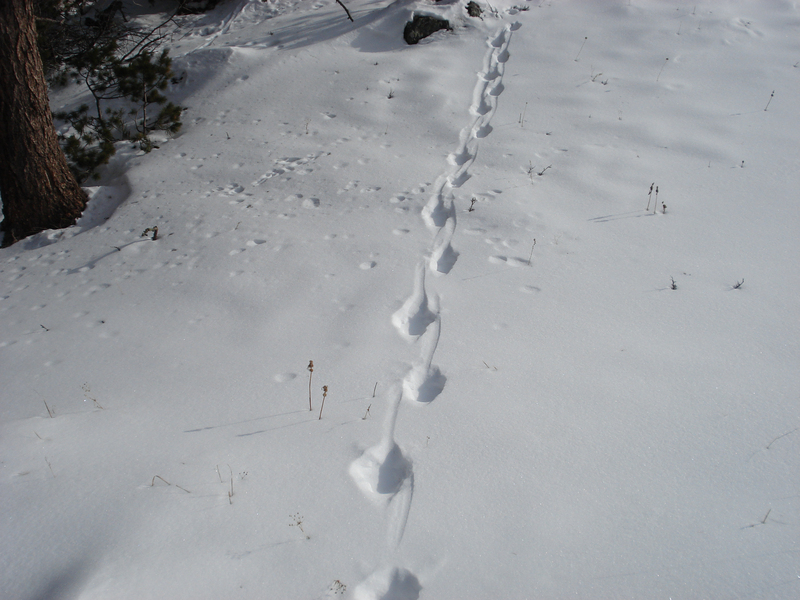 Employees of park have sent me photos of the snow leopard traces found in the last year near Archaty. 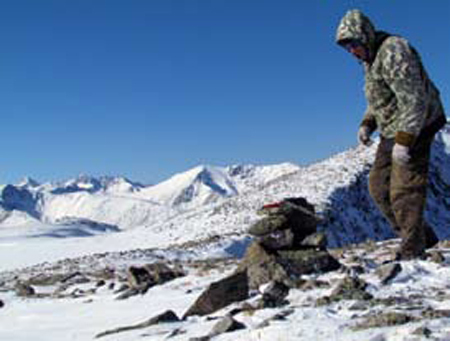 Under their data of 2012 in Katon-Karagajsky national park, 10-12 snow leopards were found. But, Vladimir Vorobjev considers that this figure needs to be reduced twice. Till the end of February of a photo-trap we will leave on a ridge of Sarymsakty (great chances to photograph a snow leopard here), and then we will move to ridge Southern Altai area, is closer to border in Russia and China.